I love picnics. They are perfect for my favorite method of eating – snacking, really. Good for cheese, a crusty baguette and some fruit for “health” purposes. Even when it’s warm out I don’t mind sitting on blankets in the grass – it’s just nice to get fresh air regardless. 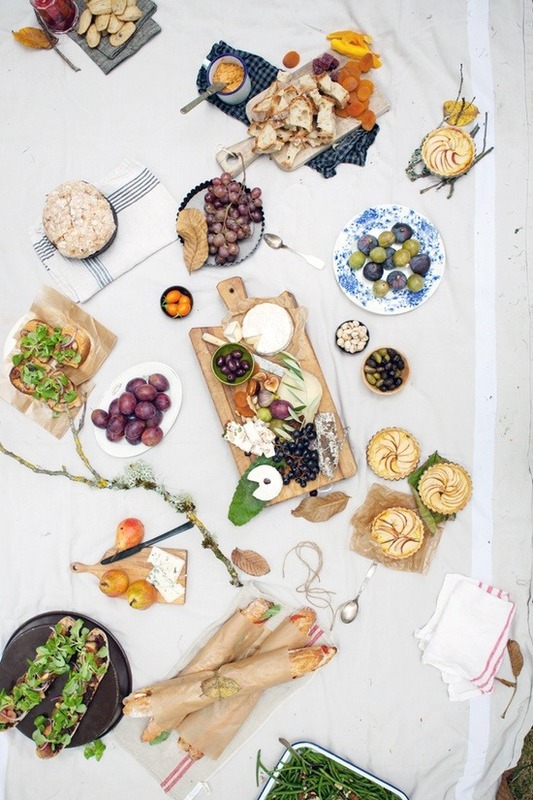 Husband hates picnics as it turns out. He does not snack for meals. He doesn’t like sitting on the ground. He doesn’t like sweating if it doesn’t involve yard work or tailgating. Regardless, last week we picnic-ed with friends for a concert at the Arboretum. It all turned out great in the end, mostly because husband got to sit on a bench instead of the ground and he thoroughly approved of our picnic meal. 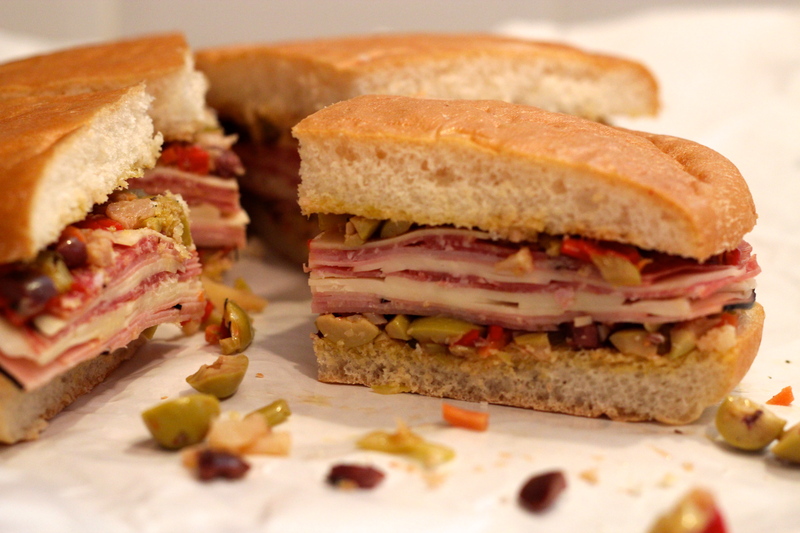 I made a muffuletta sandwich, which is a perfect travel sandwich. First, there is no mayo. Second, it gets better the longer it sits – the olive salad has time to really marinate the bread, making it most delicious a few hours after it’s made. Also, they’re huge so it’s great for sharing. Bring cauliflower, oil, oregano, thyme, carrots, celery, and 3 tbsp. water to a boil in a 2-qt. saucepan over medium-high heat. Reduce heat to medium-low and simmer, covered, until vegetables are just tender, 10–12 minutes. Transfer to a medium bowl and stir in olives, peppers, vinegar, salt, and pepper; let cool. Note, you will have more olive salad than needed for one sandwich. Slice bread in half horizontally. If thick, pull out some of the “insides” of the bread. Spread olive salad on bottom piece of bread. Layer meats and cheeses, then top with more olive salad. Top with other piece of bread. Wrap in plastic wrap. Ideally, make this and put it back in the fridge for 2-3 hours (or overnight even) before serving. Cut into quarters. And this problem is especially bad when I try to make Asian food. It’s just never quite right, and I’m not familiar enough with the ingredients to try to fix the recipe as I go. In fact, I got all the ingredients for these noodles, then put off making it for the better part of a week, then made it and still didn’t have it for lunch the day I planned because I was dreading the disappointment of mediocre Asian food. I finally ended up eating it out of desperation one night after I got stuck at work, then stuck at the gym, and was starving at 8 pm. OMG these peanut noodles were so good. So good I had to immediately tweet about them and I couldn’t wait to eat the leftovers for lunch the next day. This never happens with Asian attempts. 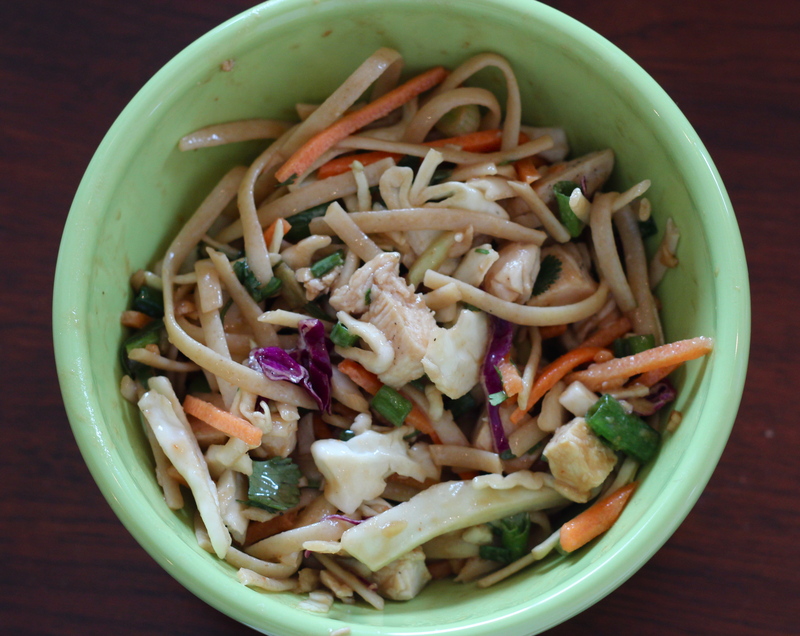 Bonus: this was a super quick recipe, especially if you (kind of) plan ahead and have leftover chicken and noodles waiting for you in the fridge. Mix dressing ingredients in a small bowl. If you don’t like spicy sauces, use less Sriracha, or add more if you like it hot. In a 4-cup or larger bowl, toss all ingredients together. When ready to serve, add dressing and toss to combine. You might not need all of the dressing. Serve cool or room temperature. Spring has taken its good sweet time to come in New York City, but after an insultingly long winter, any glimmer of warm, sunny weather means a trip to a patio for a glass of wine and snack al fresco! Lured in by a ‘Patio Open!’ sign, I dropped in Gottino in the West Village last week and helped myself to a wonderful shaved Brussels sprout salad and glass of rose. Since it was so good and I had all the ingredients on hand (we are Brussels sprouts addicts, as you know) I of course had to go home and make my version! While we are still easing into spring up here, I think this is a lovely salad to help bridge that gap. Add nuts, substitute shaved Parmesan instead of goat cheese, and toss in a lemon vinaigrette to help welcome spring and, eventually!, summer. Whisk equal parts lemon juice and olive oil in a small bowl. Add a dash of mustard and kosher salt and pepper to taste. Toss in Brussels sprouts and fennel to dress. Add raw walnuts and toss to coat. Note: this is a raw salad. If you prefer, blanch vegetables and toast walnuts. Otherwise, enjoy with a glass of wine to help with digestion. Between Cinco de Mayo and the Kentucky Derby this Saturday, this weekend is the perfect time to celebrate! 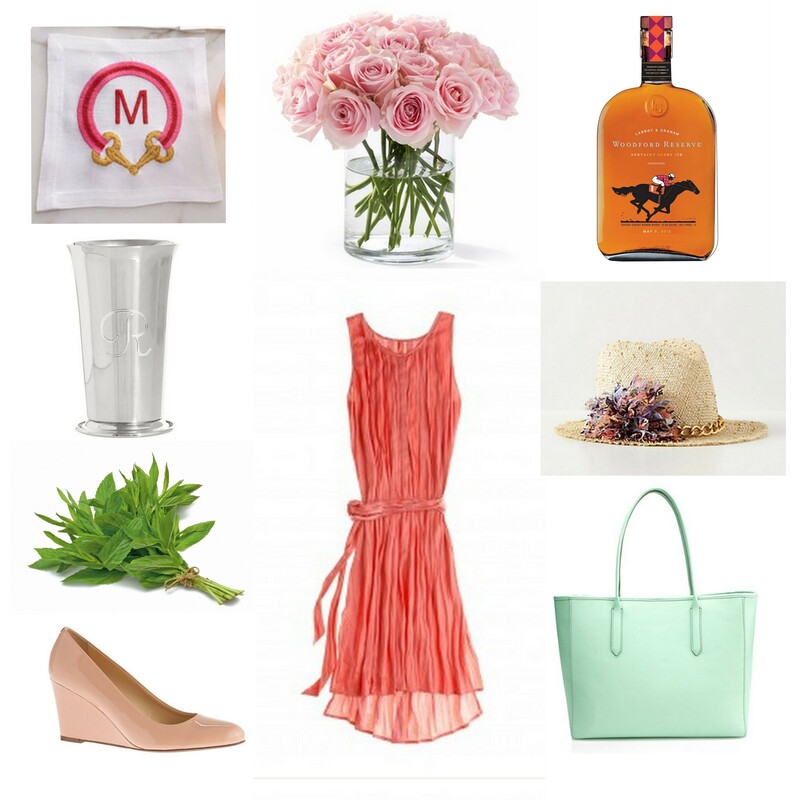 Whether you watch the races this Saturday, save up for Margaritas on a patio this Sunday, or manage both, we have some Derby themed selections to kick off the weekend and help you keep it all very stylish! Here in Texas, we love Cinco de Mayo. Perhaps unreasonably so, but regardless it’s the perfect reason for a little soiree. Recently I’ve seen two fresh takes on Cinco de Mayo decor that I just loved – probably because they both were a little less “Tex-Mex” than you typically see. Channeling Contessa posted her Cinco de Mayo spread last week (top left). I love the vibrant, almsot girly colors she used. 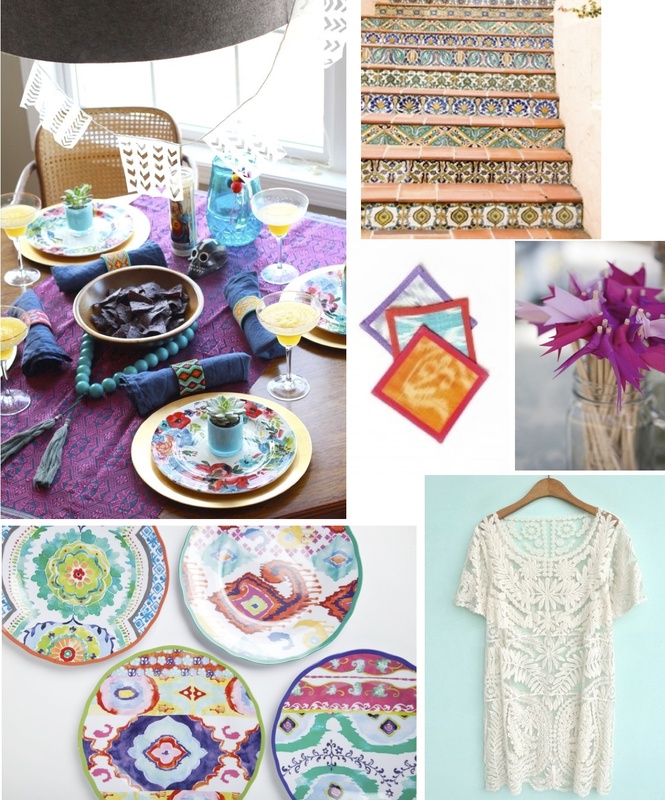 These darling melamine plates from Anthropologie and some Sheridan French cocktail napkins would provide a similar look. I’m kind of obsessed with the white lace tunic too, I think it would be a perfect hostess outfit. Camille Styles also posted a Cinco de Mayo party that looked so fun I wished my girlfriends and I had been there. 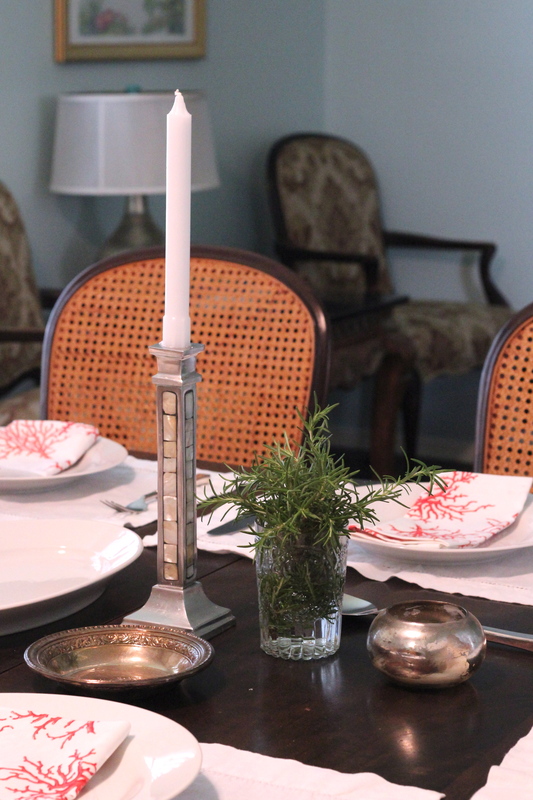 The table had a bit of a desert feel to it, complete with my new favorites – succulents. 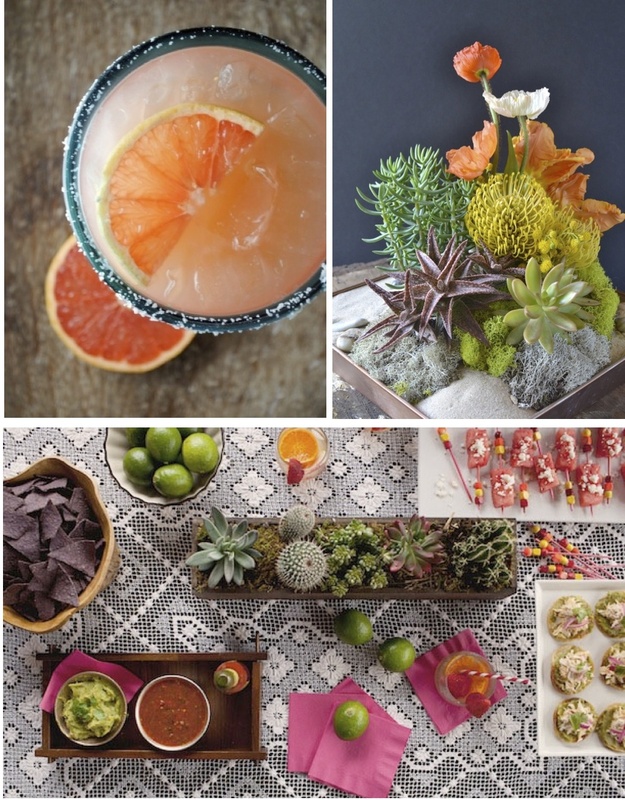 Keep it simple – Guacamole, Grapefruit margaritas and this fabulous centerpiece (via Meg Biram) would help you recreate the look! 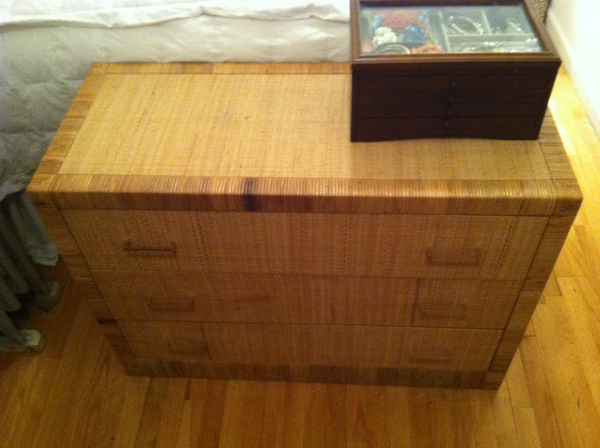 I am excited to share my freshly painted Vintage Seagrass Dresser with you! While I still have some touching up to do, I think the white paint has made a dramatic difference. 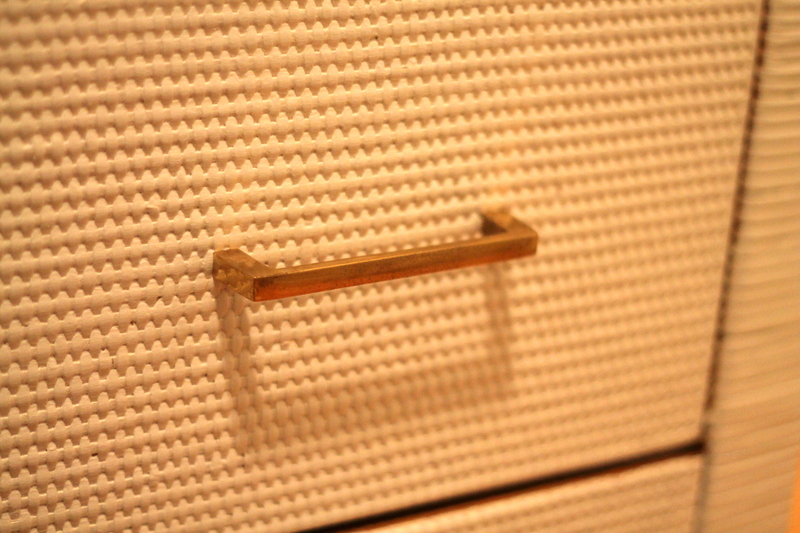 The piece now looks fresh, but still with a little vintage charm with the brass pulls. 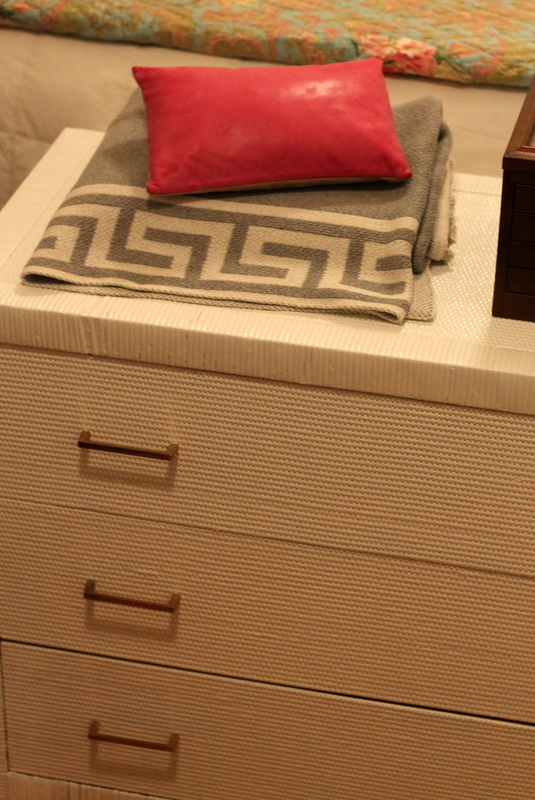 I really love how the pulls pop against the white and how my dresser doesn’t match the honey wood floor anymore. It took a lot of paint and coats to get this far, so I need to find a rainy day when I can muster the energy for that one last touch up coat. While I still have some work to do, I think it’s come a long way! 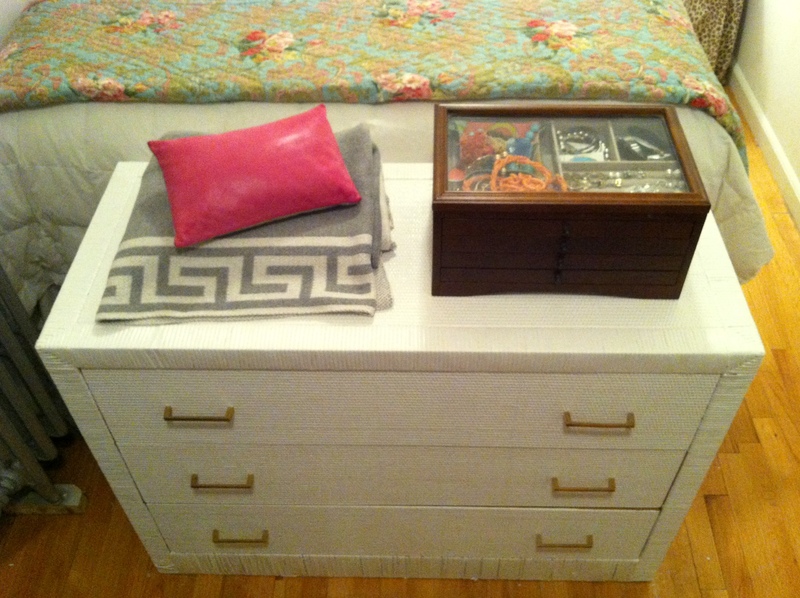 I used no VOC paint from Benjamin Moore and I highly recommend it (with Benjamin Moore and any other paint line). You give up the toxic paint smell without giving up the performance of nice paint, it is win-win. My petite New York City bedroom is very narrow, so I could only get a shot of the whole thing on my iPhone, but hopefully this still illustrates it’s great new look. Whew, this week has been a crazy one! 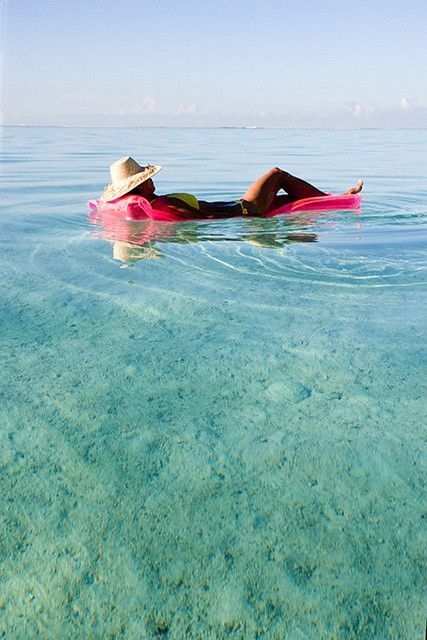 Let’s all take a mini mind vacation and sail away into the turquoise sea, shall we? Happy Weekend Friends! Apparently, my new trick for not becoming bored with potentially blah foods (couscous, rice and beans, brown rice) is to add vinaigrette. I really wish I had figured this out earlier, because I probably could have gotten on the quinoa/ farro/ bulgar bandwagon years ago if I knew adding a vinaigrette would make whole grains infinitely more appealing. 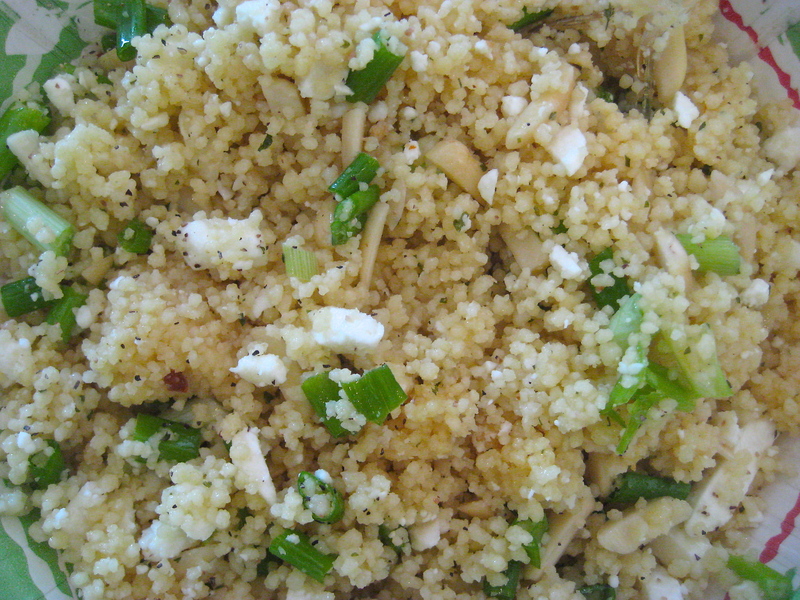 (I realize couscous is not a whole grain, but it’s the same principle.) Really, it’s just like dressing a traditional salad – and who would ever eat raw greens without a drizzle of something? While the vinaigrette does make the dish a tad more caloric, I say who.cares., because olive oil is good for you, and there is no good reason to eat boring food. *also, this is a “real life” photo. I eat out of paper bowls and use plasticware every day for lunch because our office has no kitchen. I guess I could stash a real bowl at the office for blog photos, but that would be a bit too creepy for my style. Kind of like the time I came to work with pizza dough rising in my purse. Prepare couscous according to package directions. 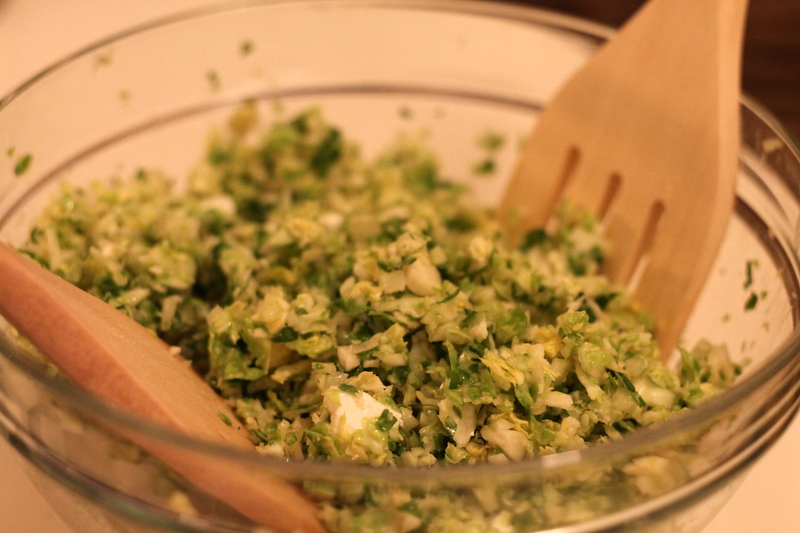 Mix in scallions, almonds and feta. Drizzle dressing over (you might not want to use all of it) then toss to combine. Serve slightly warm or at room temperature. Fresh black pepper finishes the dish nicely. I received lots of lovely gifts for my birthday. From doodles to the kindest of cards to practical, everyday tools, I felt very special on my 30th birthday! 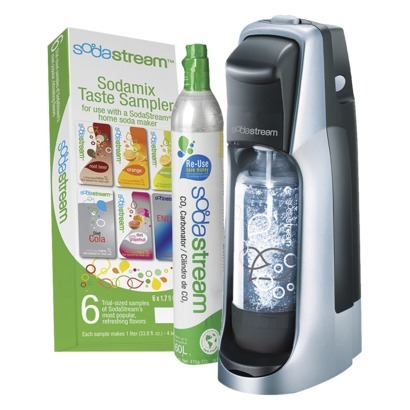 I feel compelled to add one of those gifts to our Kitchen Gadget Friday Find two weeks ago: The Soda Stream! 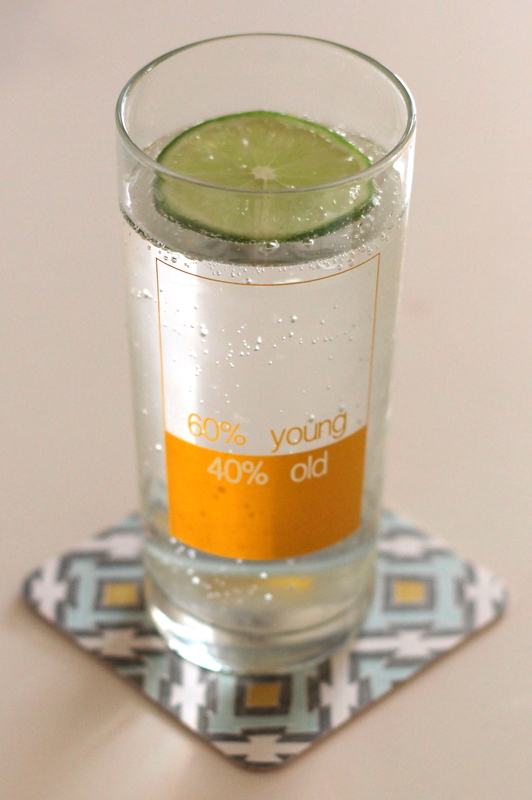 Pictured above on my faaaabulous new graphic letterpress coasters (thank you, co-blogger Liz! ), making soda at home has become part of my regular routine. Whether hydrating in the morning or giving my cocktail a little spritz in the evening, the soda stream is definitely making my life and outlook on blah water way more bubbly. This gadget splurge is definitely Deux Maisons approved. 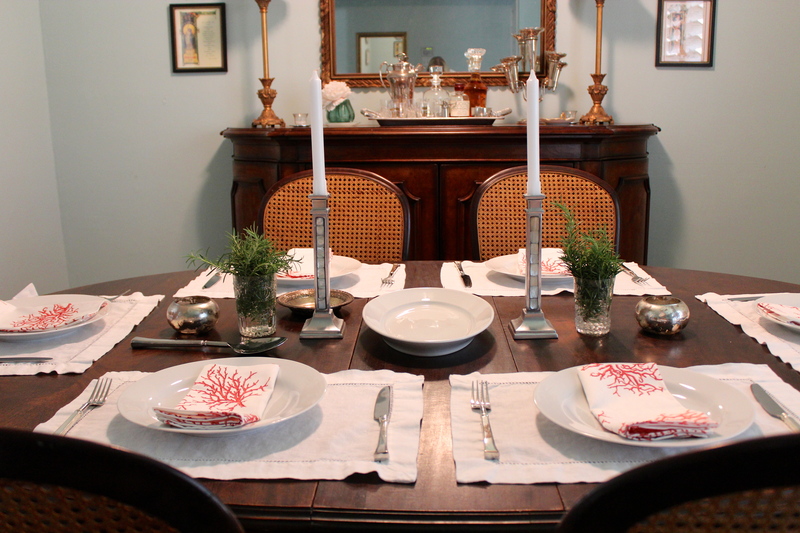 One of my favorite parts of entertaining is setting the table – and it gave me the perfect excuse to use my new napkins from Zara Home obtained in Madrid. I didn’t have any fresh flowers in the house – so off to the yard I went with my eye on the giant rosemary plant that is currently trying to take over our driveway from its happy home in the flower bed. I just snipped some branches and put them in petite vases. I kept them small since I knew we wouldn’t have a ton of room on the table, but the touch of green really brought some life to centerpiece. 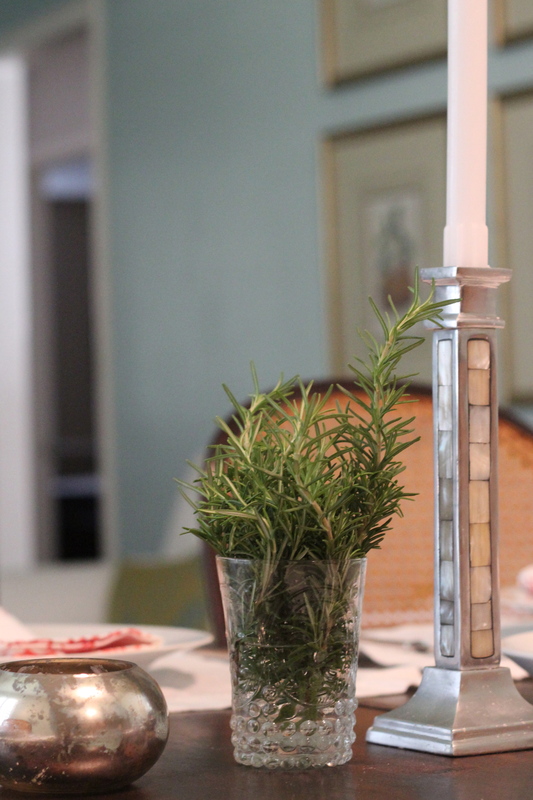 And if you have nothing green, just use lots of mini votives!